In some foot conditions, there is an issue of abnormal, limited or painful motion. This is often (but not always) related to an arthritic condition. Depending on your condition, activities, and response to conservative treatments, surgery may be discussed. 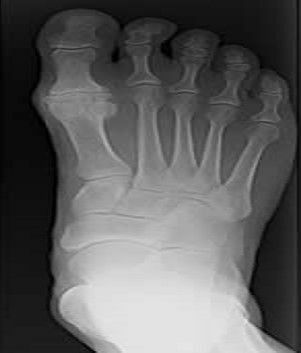 When a condition like hallux limitus is present (arthritis in the big toe joint), if severe enough, fusion of the joint may be discussed. When we, as foot surgeons, assess you for surgery, we have a lot to consider. We don't JUST look at the x-rays and your foot, but we also talk to you about your activity and fitness goals. We realize that there is a person attached to that foot! If you are a runner, you may worry that you won't be able to run anymore. You may be surprised to see during your exam how much motion you are already functioning without. In cases where great toe joint fusion is suggested, it often means that your motion is already nearly completely lost and the benefit of fusion is to give you a stable foot that does not any longer have bone on bone rubbing - as motion is taken out of the equation. Be sure to discuss your concerns and goals with your doctor before going through surgery. Be an advocate for yourself!